The CLL Library comprises approximately 5,000 colour transparencies and more than 3,000 colour prints, concentrating primarily on rural images including domestic livestock, wildlife, flora, and landscape. Our images of livestock include not only a wide variety of native British breeds of several species, such as rare Bagot goats pictured below at Appleby Castle in Westmorland (© CLL), but also exotic breeds from many parts of the world. 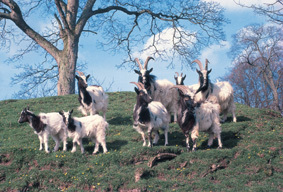 The Bagot goat is one of only a handul of breeds in Britain with less than 100 breeding females. Its security is precarious, but it is an unusual and attractive animal that has been listed as 'Critical' for more than 40 years. 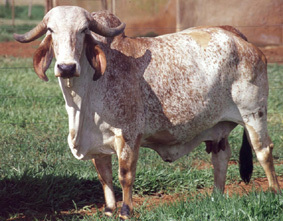 The colour of the wild ancestors of our modern breeds of cattle, sheep, goats, horses, pigs and poultry was usually drab and unspectacular being determined primarily by the need for camouflage, but domestication permitted a wider range of colour and marking patterns. rumps of Pietrain pigs and Beltex sheep, pendulous ears of Gir cattle (above right © CLL) and Nubian goats, and fat-tailed sheep of Zululand. 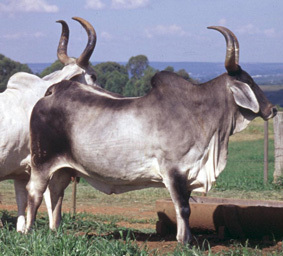 The variety found in livestock breeds around the world is not only a rich source of material for photographers, but also an integral part of the genetic diversity so essential for ongoing adaptation to the changing environment. 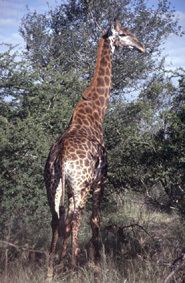 The wildlife images are devoted mainly to African subjects. Close encounters with lion, buffalo and rhinoceros in South Africa, Tanzania and Swaziland were dramatically memorable. The disdainful elegance of resident giraffe (below left in Swaziland © CLL) and jaunty cheek o f warthog mixed with the swooping swal lows that had summered in the British Isles. The mass of migrating wildebeest was in vivid contrast to the plight of the dwindling number of black rhino decimated by poaching, and the image of a mound of rhino skulls - minus the horn (right © CLL) - is an unforgettable nightmare. Images of flora are located mainly in England, and some in Africa. Many visitors think of typical British flora as bluebell woods, snowdrop glades and Wordsworth's daffodils, b ut the delicate silver birch, open heather moorland and flowering meadows also have a special appeal. 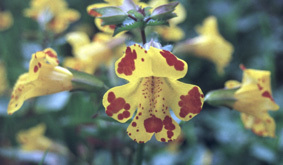 Mimulus luteus (pictured on right © CLL) is not a native of Britain, but flourished temporarily in unfamiliar haunts on the banks of the Tees. Teesdale typically shares with the Burren in County Clare a unique Alpine flora. Other countries also have iconic plants. The dehesa in Spain is an integral part of the specialist processed ham industry and the Mediterranean Pine at Rudolpho on the Amalfi coast features regularly in tourist advertisements. The lush gardens at Kirstenbosch near Cape Town host many exotic plants, while acacia thrive on the wide spaces of the Serengeti. In CLL there is a particular fondness for commonplace gorse and berberis that combine its 'house colours' of gold and green. The appeal of rural landscape is universal. 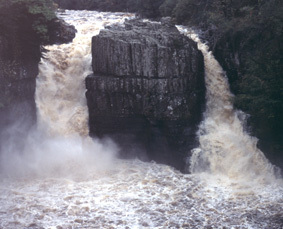 Our folio includes not only dramatic foreign landscapes such as Table Mountain towering over Cape Town or the fall colours in New England, but also similarly spectacular British features such as High Force in Teesdale or the sea cliffs of the Orkney and Shetland Islands. Less dramatic, but equally impressive, scenes can be found in many hidden corners, and we have a number of studies in various regions of the British Isles, especially in the North of England, where bleak open moorland hides waterfalls (Cauldron Snout, Cautley Spout, and Devil's Cauldron), cliffs and countless lakes, tarns and meres. The soothing gentleness of Rydal Water contrasts with the atmospheric intensity of storms over Ullswater that fill some with fear and exhilarate others.